"This was handed down to me by Mom, a Cincinnati native. Skimming the fat makes this a healthier version than most, and gives it the right consistency. I like mine 4-way, with spaghetti, raw chopped onions, grated mild cheddar, and oyster crackers!" Place the ground beef in a large pan, cover with about 1 quart of cold water, and bring to a boil, stirring and breaking up the beef with a fork to a fine texture. Slowly boil until the meat is thoroughly cooked, about 30 minutes, then remove from heat and refrigerate in the pan overnight. The next day, skim the solid fat from the top of the pan, and discard the fat. Place the beef mixture over medium heat, and stir in the onions, tomato sauce, vinegar, Worcestershire sauce, garlic, chocolate, chili powder, salt, cumin, cinnamon, cayenne pepper, cloves, allspice berries, and bay leaf. Bring to a boil, reduce heat to a simmer, and cook, stirring occasionally, for 3 hours. Add water if necessary to prevent the chili from burning. 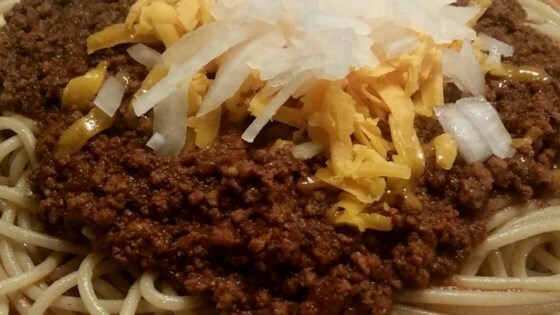 I'm from Cincinnati and enjoyed Skyline chili my whole life. This recipe is the closest to the original Skyline taste and texture of any I've tested. Great recipe - Great chili.